Living in Oregon, we are surrounded by water; from rain to rivers, to waterfalls we have it all. Incorporating water into your landscape design creates an alluring and tranquil environment that will make you feel one with nature. If you have been considering adding a water feature to your landscaping but don’t know where to start, look no further! We have put together a short post covering the 3 most popular ways water can have a role in landscape design. 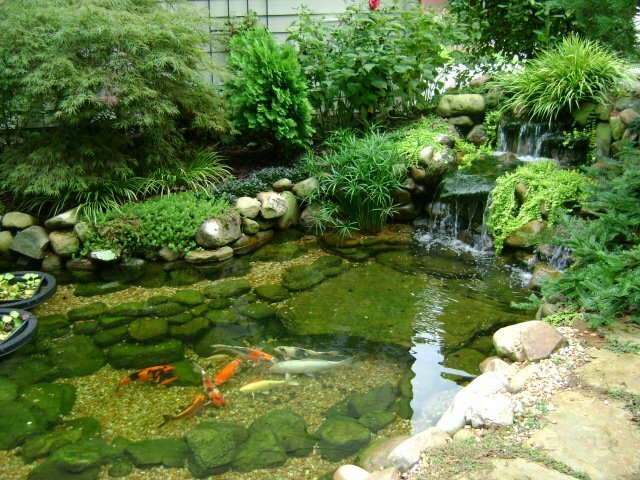 Depending on the pond or water garden that you install, maintenance levels will vary. If your water feature will have fish or other live animals in it, remember that maintenance will be key. If you choose to go a different route, you will have to be mindful of algae and water clogs. Regardless of your choice, taking the opportunity to add a pond or water garden to your landscaping will be a pleasant addition. Nothing compares to the sounds of a waterfall. There is something about the crashing and splashing as the water hits that brings peace to your environment. Don’t forget that backyard waterfalls come in all shapes and sizes. Get creative using different mediums, such as rocks, concrete, or wood. Different heights create different sounds and water flow plays into this as well. The water usage can easily be adjusted to create what you desire! Outdoor fountains could be considered the gateway to incorporating water into your landscape design. When you notice the tranquility a fountain can bring to your backyard, you’ll want more! After reading this post, you are probably visualizing and hearing the role water can play in landscape design. The sound of water has been known to be beneficial to our minds and bodies, so why not add some to your life? If you are interested in adding a water feature to your backyard, give us a call. Our skilled landscape designers can create the perfect landscape for you, while taking into consideration your preferred style, water usage, and maintenance needs. At Crowley Landscape Management, we can make your landscaping visions comes true!